I love Romwe because of their jewellery range. Every time I visit romwe for some sale offers on clothing, but end up buying some gorgeous pieces of jewellery and for this time I've picked up the special edition box of J.Crew. It comes with five gorgeous piece of rings. I was impressed with the packaging the ring came in a black gift box in 16.5mm size. Romwe Street fashion is famous among fashion junkies because of their clothing and apparel range, but the thing tempted me to visit romwe every time is their jewllery range. They offer jewellery range at super low prices. The delivery is super fast and they offer free worldwide shipping with no minimum purchase required and you can't beat the price! Well! I love the set comes with five luxury style of fashion rings, All designs are unique and delicate, but sturdy and well made. I fell in love with this luxury set when I first saw this set on Romwe and couldn't resist buying it. I adore the quality, very trendy and classy and all rings are equally beautiful, but my favorite one is Shining. I just feel like I'd never put them off! You can visit Romwe for their dynamic collection. I had the best personal experience with Romwe and their customer service along with fastest delivery worldwide, making the whole experience that much more pleasant. You will get five luxury rings just in 17 dollars. It could be a best gift for your friend. Style look luxury and unique. Ring size is way to small although three rings are adjustable. These are very light and not durable. I really love it and I would recommend it. They are very pretty, my fave is the bow one. Too bad all of them do not have adjustable sizes..
Oh my goodness! I tried to pick my favourite of those rings but I honestly just love them all. Beautiful set! I will order one too. Thank you for your lovely comment on my blog. Following you too! These rings are so cute, I wish my had J. Crew more available in the UK. I can't buy any rings online because I need to try them on first! I added a follow button to my blog so you can follow me now! Didn't even notice before that it wasn't there so thanks so much for letting me know! What an amazing buy, love the Shining ring too! Check out the highly coveted vintage headpiece giveaway by Cathleen Jia on Daring Coco! They're cute! I like lovely since it's simple. I really love your blog..now I follow you with google friend connect! Hope you'll do the same! I wait for you in my blog! I follow you, would you like to follow me back? Great box of rings!! Thanks for your nice comment on my blog and for following! I'm following back! Oh, these look so sweet, but I always have to try rings before I buy them because I've got chubby fingers =) Will be on the lookout for other nice pieces tho, thanks! I like your blog! Those rings are beautiful, love the idea. cute & thank you for commenting & following my blog. Great blog, I am following you now and I would love it if you could follow back ! wow i really love all of them! it's so cute how they named those rings hehe. J. Crew Limited Edition = my new LOVE ;-). Great Collection of Rings! Beautiful! Following u back dear! I love this rings, especially the bow one but this cheap jewelry can be easily ruined... That's what I hate most! Nice but too girly for my taste. romwe is an amazing brand. following you back! Beautiful rings love your blog! so cute! thanks for your lovely comment too.. following you back on GFC now! Thank you for following my blog. I have followed yours too. I love your blog! Im following you now, if you like my blog, follow me please. 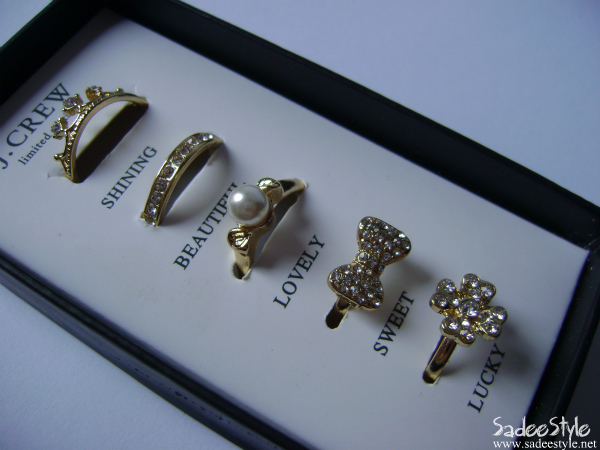 I loooove those rings<3 The "shining" one is my favorite but they all are just gorgeous:) Now following you back! Beautiful collection! beautiful blog! thanks 4 your sweet comment. Hope to see u soon in "KS"
Thank you for visiting my blog and follow me! Our page is fantastic! Kisses* have a great week! I'm going to follow you! Such pretty rings! I want all of them! Come check out my blog, if you like it I would love it if you followed me. Thank you for visiting my blog,I am following you since days. :),I am on your list. Thanks for your comment on my blog - I'm following you back! 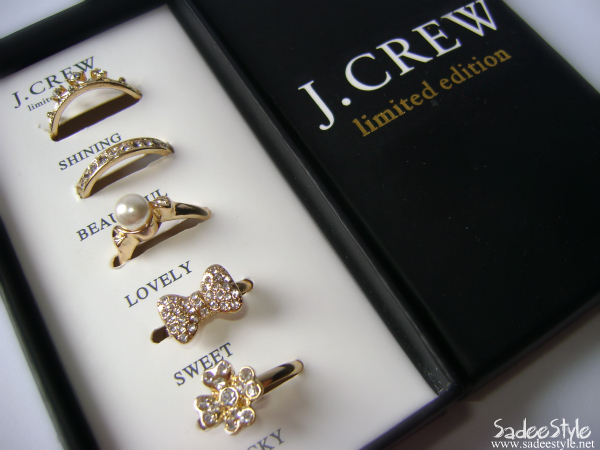 I LOVE these rings, especially the bow one!